Haaker Equipment Company, through our division of Total Clean Equipment, proudly offers floor scrubbers, floor cleaning equipment and industrial sweepers for sale for your commercial and industrial floor cleaning operation. We even have sewer cleaning tools like sewer nozzles for sale, because when it comes to cleaning we make sure to cover all the bases! We are the largest industrial dealer for Advance floor sweepers and industrial sweeper scrubbers in the country. We have a fleet of new and used floor scrubbers for sale and rental sweeper floor scrubbers available. Our selection of industrial floor sweepers and floor scrubbers are safe, easy to operate, productive, and easy to maintain while using the least possible resources. The result is increased productivity and a safer, cleaner environment at the lowest total cost of ownership. We also offer the best of fuel-efficient green cleaning equipment on the market. Total Clean Equipment is an award winning division that delivers the best floor cleaning equipment and products in California and Nevada. 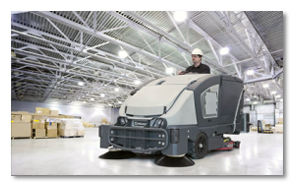 The Advance Exterra industrial sweeper is unsurpassed in indoor and outdoor power sweeping. A 50 inch main broom – the widest in this sweeper class – combined with full time dust controlled dual side brooms, creates an incredible 77 inch sweep path. On conventional industrial sweepers, dust is controlled at the main broom and, the side brooms must be raised in open areas to prevent airborne fugitive dust. The innovative DustClear™ Five Stage Dust Control System allows for full time use of the dual side brooms by controlling dust along the entire sweep path – including the side brooms with a fine “fog” that is applied to suppress the dust. Total Clean offers California and Nevada the best floor scrubbers in the industry. The CS7000 is the industry’s first true combination sweeper-scrubber that is available as a hybrid or e-power machine, which greatly reduces the overall cost of ownership. Advance is one of the world’s largest manufacturers of industrial floor cleaning equipment and is committed to working with its customers to develop high quality floor scrubbers. 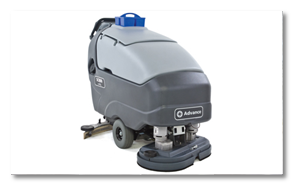 Advance is a leader in green cleaning equipment with the CS7000. Advance eliminated all major hydraulic components on the model so operators use half the fuel and get twice the run time. Additionally, the elimination of hydraulic components gives users an added benefit that all leak points are virtually eliminated, assuring that your floors will be left clean and safe. With a one-touch integrated system, operation of the unit is simple and effective, making the CS7000 cleaner and smarter. If you have a floor we can help you clean it with our floor scrubbers! If you are looking for a walk-behind auto floor scrubber, consider the easy-to-maintain and operate Advance Warrior floor scrubber that is available with multiple deck options from 28” to 32” widths and cylindrical or disc brushes. With the tools-free interchangeable disc and cylindrical scrub decks, the Warrior scrubber has the flexibility to scrub on multiple surfaces in one pass. Floor scrubbers are great low cost option to improve the productivity of your floor cleaning operation. 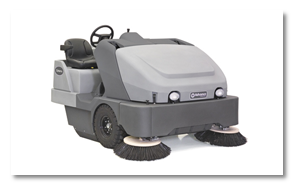 We stock new and used floor scrubbers in Los Angeles and in our branch in Las Vegas. Our fleet of rental floor scrubbers can be used for a weekend clean up or for extended rentals when you need it. 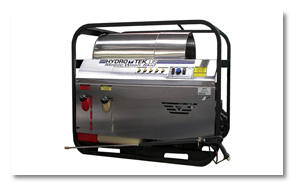 HydroTek pressure washers are self-contained high output hot pressure washer with serious, industrial cleaning power. They are designed to withstand daily use by professionals who rely on its dependability and cleaning speed top make a living. The SC Series pressure washer includes a super high output burner with extended fuel capacities and a 2.9 Kw generator with 115v auxiliary power outlets that are perfect for lights or other optional equipment like our wash water recovery systems or water recycling systems. Its high impact cleaning power, rugged stainless steel construction and Pro-Tect-It frame enable it to handle huge cleaning tasks with ease and without the need for an outside power source. The SC pressure washer has proven itself time and time again in commercial and industrial applications, so whether you are cleaning ships, heavy equipment, buildings or concrete – the SC will be on hand, giving you the power to get the job done right. Haaker Equipment Company is proud to serve areas within California and Nevada, as well as the city of Phoenix, Arizona. For any questions you may have about our industrial cleaning equipment and products, you may send us a message by filling out the form on our Contact page.